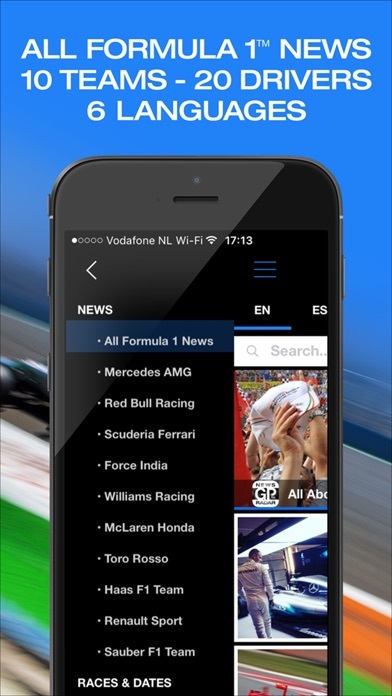 The GP™ NewsRadar App brings you all the global news about Formula One™ Racing. Our advanced search engines are constantly scanning the worldwide web, providing you with all the latest news about Formula One™ in general, but also specific news about all the teams and all the drivers. Our chronological NewsFeed is truly unique and simply the most complete: not only the hottest news items about Formula One™ from all credible GP™ sources, but we include also Twitter-, Facebook- and Instagram messages about the drivers and all the relevant reporters and influencers in Formula One™. All in 1 App! The App is very easy to navigate and we show you all the original sources where we found the articles. If you want to be on top of the GP™ News, this App brings it all. Totally uncensored, so real news, from all sides!